Which skin tone to smear on? Which accent to speak in? Didnít Ayi Kwei preserve our history in the pages of unpublished books? Tswarelo Mothobe h.t.b.k.a (Happy To Be Known As) A Scribe Called Tswa is a Bulawayo born and based writer, dramatist and poet. 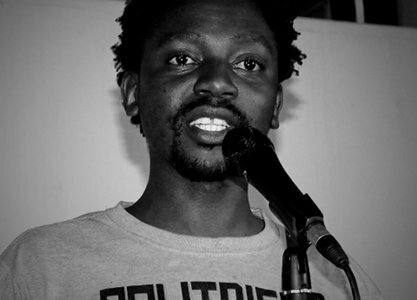 He has graced the Mlom’Wakho Poetry Slam Stage, The House of Hunger Poetry slam, major local festivals like HIFA, Intwasa, Shoko & Ibumba Arts Festivals and has performed at SANAA in South Africa. He has also facilitated various writing and performance workshops with school children over the years resulting in new generations of poets being born in Bulawayo. Currently hosting Mlom’Wakho Poetry Slam every month, he is working on his 1st poetry and music project with the working title, Remember and has written and is directing a series of plays.